Review : I've really come to enjoy lemon teas, probably because I enjoy lemon flavored water...or simply a piece of lemon in some water. And of course, I absolutely adore mint...anything mint. So, what do you get when you combine the two together? Hmmm...interesting question actually, and one I was looking forward to finding out. Which is why I ordered a Lemon Balm Mint Tea during my last order with Dragonwater Tea Company (now out of business). This tea packs quite the aromatic punch. Looking over the ingredients you'll soon discover why. The Lemon Balm Mint Tea from Dragonwater Tea Company (now out of business) contains the following ingredients : lemon balm, peppermint, spearmint leaves. This is a organic tea. The aroma, of this tea as you might expect, is strongly slanted towards mint. In particular....peppermint. Yet, you'll also get plenty of aromatic fragrances from the lemon and spearmint in this tea too. The flavor of this tea was excellent, although somewhat surprisingly, wasn't quite what I was expecting. In particular, and somewhat oddly, I actually thought the aroma of this tea was stronger than the actual taste! Once brewed, this tea looks like other mint teas...sort of a light tan/green color. I was fully expecting to find a very strong peppermint flavor in this tea. But it was not to be. Instead, what you get is a blending of the spearmint, peppermint and lemon in this tea. The peppermint and spearmint sort of blend together to produce a "generic mint" flavor, and you really can't seperate out either of them individually. 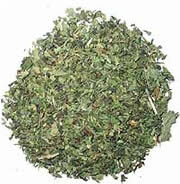 This flavor then mixes with the lemon in this tea, subduing the mint flavor even more. The lemon flavor isn't bad at all, it is actually quite good, but wasn't especially strong either. And maybe that was my "slight problem" with this particular tea. The blending of these three ingredients seemed to reduce the total flavor of this tea somewhat, thus giving the tea a more powerful aroma than actual flavor. Don't get me wrong, it's still strong...but not even in the same league as say a full peppermint or full spearmint tea. The after-taste was also sort of a mixed bag. Normal peppermint and spearmint teas have after-tastes that can linger seemingly for hours. This tea didn't have that. Instead, it is the lemon flavor that sort of lingers around...and produces a very slight bitter taste, at least to my palette. Recommendation : Yes. While the tea packs quite the aromatic punch, the flavor isn't nearly as strong as say a traditional mint or peppermint tea. Instead, it's a softer blending, with a moderate strength of lemon flavor to boot. If you like mint teas, you'll definitely enjoy this one to some extent. Likewise, if you like lemon teas, you should also enjoy this tea too. Just don't expect the full flavor punch of a normal loose-leaf peppermint or spearmint tea! Brewing Instructions : Use one teaspoon (or a bit more) of tea leaves. Pour 1 cup (5.5 ounces, but 6 works quite nicely) boiling water over the leaves. Let the tea brew for 5-10 minutes. 7.5 minutes brewing time was used for this tea review.